Basic information: John Wesley was a Church of England cleric and Christian theologian. 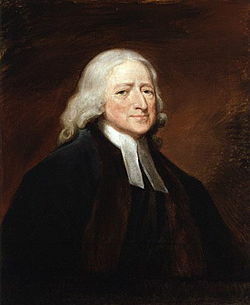 Wesley is largely credited, along with his brother Charles Wesley, as founding the Methodist movement which began when he took to open-air preaching in a similar manner to George Whitefield. In contrast to George Whitefield's Calvinism, Wesley embraced the Arminian doctrines that were dominant in the 18th-century Church of England.